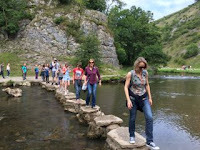 A long, group walk up Dovedale Valley. Beautiful scenery and lucky with the weather. Apparently Byron once wrote that it was "as noble as Greece or Switzerland". It's certainly very pretty.